Size: 8.1" x 5.3" x 1.9"
The €-2004 calculator combines the usual printing desktop calculator functions with an Euro currency conversion. The exchange rate between the Euro and the Home currency is entered with the small SET-key. Two additional keys allow the conversion in both directions. 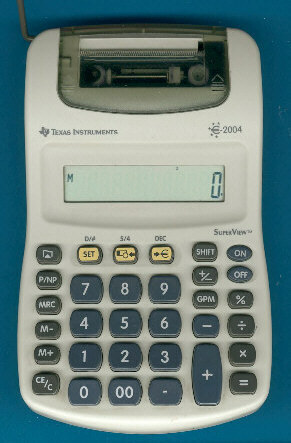 Non printing desktop calculators with Euro conversion were introduced with the €-1796, €-2002+ and €-2003, mid-size and high-end printing calculators with the €-2005, €-2006 and €-5032. An identical housing was used with the TI-5019SV missing the Euro conversion feature. © Joerg Woerner, January 11, 2002. No reprints without written permission.